Hari Achuthan, Executive Director of ACO Investments and Chairman and Chief Executive Officer of Convalt Energy, and Dr. Deputy Prime Minister and Minister of Planning and Investment Khieu Kanharoen, Deputy Minister of Planning and Investment, attended the signing ceremony in Vientiane. 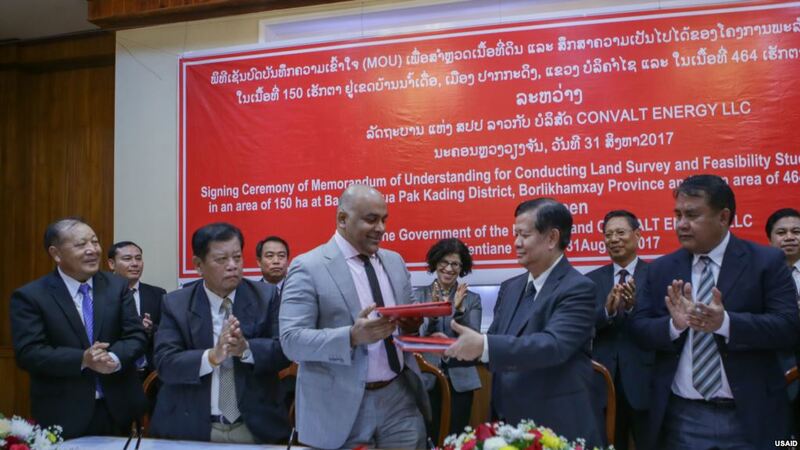 On August 31, US LLC Convalt Energy entered into an agreement with the Government of Lao PDR to invest approximately US $ 400 million to develop solar power plants in Attapeu and Bolikhamxay provinces. This project will diversify Laos' energy generation and enhance generation power during the dry season. Under the agreement, Convalt Energy, with the assistance of the Ministry of Planning and Investment, the Ministry of Energy and Mines, and the provincial governments of Attapeu and Bolikhamxay, will establish several solar power plants with a capacity of 300 megawatts (MW) by 2019. Hari Achuthan, Managing Director of ACO Investment Group and Chairman and CEO of Convalt Energy, said ACO is the lead investor for this project, along with partners from other institutions and banks. This project marks the largest US investment in Laos to date and will generate more economic opportunities for businesses and workers in both Laos and the United States. Convalt expects the project to create around 400 jobs and up to 200 permanent jobs for the operation of the power plants. Convalt and its partner General Electric Company (NYSE: GE) are currently working on a 300 MW solar power project in Mandalay Region of Myanmar. Convalt and GE will strategically work together on this project in Lao PDR as well. Convalt Energy was founded in 2011 as a portfolio company of ACO Investment Group. Convalt Energy is primarily focused on developing, operating and maintaining energy generation, transmission and distribution of assets. See www.convalt.com for more information about the company.